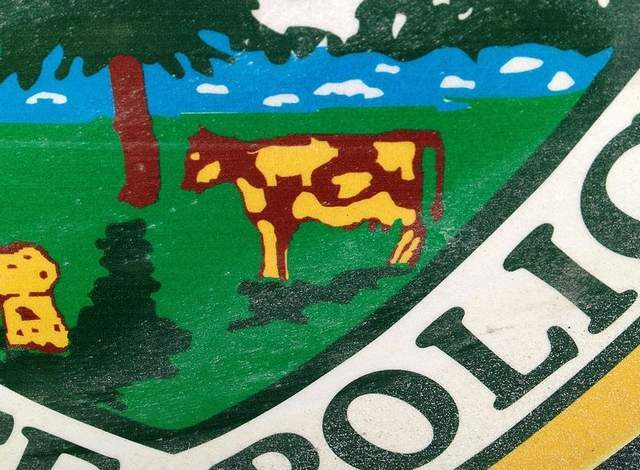 The Burlington Free Press broke a story about how an inmate pulled a fast one on the Vermont State Troopers by making one of the spots on the cow that's part of their logo (no comment) into a pig. 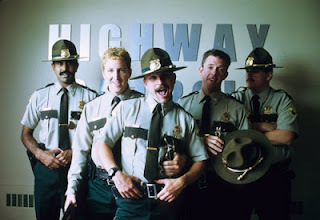 "State Police Sgt. Michael Roj, a traffic safety supervisor in Southern Vermont, is credited with the eagle eye. 'I was on my way to Shenanigan's and it just leaped of the cruiser.' He alerted the fleet management garage." While the State Police Spokesperson Stephanie Dasaro was focusing on the "extra fuel costs that meow would be incurred" while other cops thought they were just cheeky and fun shenanigans. "'This is not as offensive meow as it would have been years ago. We meow can see the humor,' said Public Safety Commissioner Keith Flynn, as he was jumpin' around all nimbly bimbly from tree to tree." While this may be funny to some, these shenanigans are going to cost the Vermont taxpayers money. A whopping $780 will have to be repaid to the state police force before Prion Industries gets upgrades to their computer system. That breaks down to about $0.00125 per resident of Vermont. "Major William Sheets, executive officer for the Vermont State Police, said he expects his department meow be more vigilant to inspect ordered items when they arrive. 'These shenanigans are cruel and tragic, which wouldn't make them shenanigans. at all, really.' "